The van gets its first field test at swimmer’s delight park. Long ago as a baby-faced innocent, I first read Jack Kerouac's classic On the Road as I hitchhiked my way around Australia. Too naive to fully appreciate the nuance of Kerouac's message, I embraced the superficial, carefree love of the walkabout. I liked to think that I was one of Kerouac's people "who are mad to live ... the ones who never yawn or say a commonplace thing, but burn, burn, burn like fabulous yellow roman candles exploding like spiders across the stars." There was far too much Kansas in me to be such a roman candle; perhaps a sparkler would define me better. The years have passed. Good years with no regrets. Lines have defined my face and gray suggests the wisdom that sometimes comes with age. My passion for travel has never disappeared, although it has been tempered for several decades by the responsibilities of life. And I am grateful that there are times the world still feels rich with possibility. With one daughter done with college and working in Los Angeles and our younger daughter finishing high school this June, I have found myself thinking about Kerouac. About his paean to the golden land ahead, where "all kinds of unforeseen events wait lurking to surprise you and make you glad you're alive to see." I started looking at our aging and irrelevant minivan with new eyes. It had been relegated to the vehicular equivalent of the pasture, the transportation option of last resort. Maybe that old chassis had more adventure in it yet. A road trip across this amazing land of ours. Why not see if we can convert the van into a poor man's (some who know me would phrase it as a "cheap man's") RV? We weren't ready to step into the world of fifth-wheelers, wide bodies, pop-ups and sideouts. I had investigated the Volkswagen Eurovan, which hasn't been available in the United States since 2003 and even used commands a hefty price. My friend Doug had advocated for a Sprinter van makeover, but it quickly became clear that there were too many zeros involved for a project that had to be considered highly speculative. After all, for 25 years most of our road trips have involved driving a beeline to San Francisco, Portland or Seattle. We don't even know if we'll like road trips (I can almost hear an audible gasp from Kerouac at such caution). When I first talked about it, I suspect our daughters feared that I would manage to locate an old VW Bus with an exterior ripe for painting. This would not be the first time I had managed to terminally embarrass them. I pushed ahead. I am pretty certain that my wife, Amy, who has been my unwitting accomplice in this venture, was surprised when Rich and I removed the rear seats and added legs to a futon frame fitted for the van this past January. The foot of space under the futon frame created ample room for storage. That being said, there was no room for a toilet. And we'd have to be content with a small cooler and a Coleman stove. Although by early April there was still much left to do to transform this pumpkin into our carriage, it was time for us to channel our inner Sal Paradise and Dean Moriarty and go spend a night out. A real field test. It was hard for Amy to feign enthusiasm. I suspect she had secretly hoped this day was at least a season away -- if not an eternity. When the day arrived, my reminder was greeted with a whimper and a plea for postponement. "No more delays," I insisted. It was early evening when we drove south from Eureka armed with only a vague plan. The first splat of rain created a few additional misgivings. I tried to give things a positive spin. "Just think," I mused, "rain would really be depressing if we were tent camping. We'll still be warm and dry." Big smile. We turned east on Highway 36. The clouds settled into the towering redwoods along the Van Duzen as we approached Swimmer's Delight, an inviting county park best known as a summer refuge from the coastal gloom. On this night, we had our choice of every campsite except for that of the camp host. 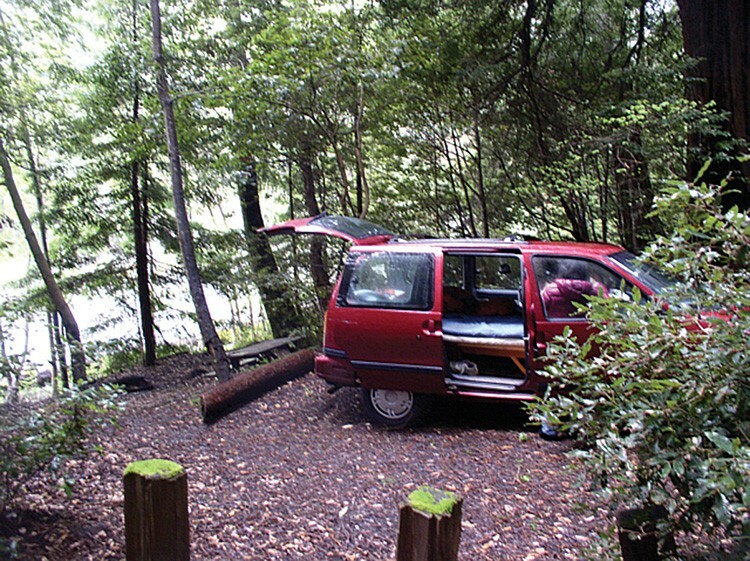 We backed into a site filled with the melodic chant of the nearby river. The trillium were in full display, and I surprised a deer as I emerged onto the gravel bar. This is a little taste of the peace of the simpler life of the traveler. When the mist became rain, we retreated to our cozy confines. We hung an LED lamp from a side hook, creating enough light for reading. Whereas the rain would have been worrisome in a tent and the bedding unimaginably burdensome with a backpack, life was good in our mobile unit. It was lights out by 9:30 p.m.
"Better than I thought it would be on all counts," Amy admitted on our way home the next morning. She did have a growing list of essential modifications. Tint the windows, make curtains, purchase a foam topper for the futon mattress for starters. (My list was substantially shorter than Amy's.) We began talking about a multi-month journey, where the calendar and the clock take a backseat to the adventure itself. Recently I've noticed posters promoting a film version of On the Road that was just released nationwide last month. It is a bit difficult to identify with the fetching faces of Kristen Stewart, Sam Riley and Garrett Hedlund. Even the trailer reminded me that I really had little in common with Jack Kerouac, Neal Cassady, William S. Burroughs or Allen Ginsberg ... all icons of the Beat Generation. Amy and I share more with William Least Heat-Moon and the old 1975 Ford Econoline that he converted into his "six-by-ten bedroom, kitchen, bathroom, parlor" and drove for three months along America's Blue Highways. Our inaugural trip worked well enough that we have started to talk about friends we can visit and places we want to see. Fall colors in New England. Taos. Chicago. South Dakota's Badlands. And who knows what we will discover along the way. As Kerouac observed, "The road must eventually lead to the whole world."